Highly-collectable re-release, 40 years on! Order from Amazon USA here | Win it! 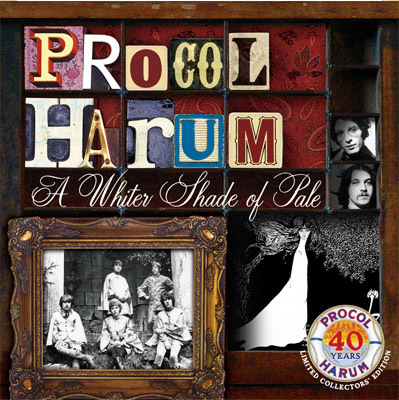 A Whiter Shade of Pale: the original mono single version newly remastered in 2007; Whisky Train: remastered in 2007 from the original master tape. All This And More: remastered in 2007 from the original master tape. Magdalene (My Regal Zonophone): Previously unreleased version of song that appeared on Shine On Brightly, but had been originally recorded during sessions for their début eponymous album. The story is often repeated that it was erased in error by the recording engineer, and and early acetate had previously been the sole version of this wonderful performance. Recently discovered among tapes of recordings dating from 1967, this version was mastered in 2007. There have been some exchanges with Matthew Fisher's lawyers over his entitlement to a writer's credit on A Whiter Shade of Pale, which is included on the new anthology due for release on 27 August, a date prior to the judgement of the appeal court due to sit in October. by the Court of Appeal in 2007"
In years to come this, and the imminent single release of A Whiter Shade of Pale, should be collectable items.